Optional Single Supplement: $1164 USD (number of singles limited). This tour may require a mandatory single supplement charge of $582 if you join our share program and we are unable to pair you. Ireland is a land of legends, where history meets myths and the landscape inspires timeless literature and art. On our Ireland group tours, we delve into the iconic vistas, charming villages, and cobbled walkways that make this historic land famous. It is a journey for those who enjoy a culture that prides itself on a friendly image, and for those who fancy a geographic landscape that is nothing short of awe-inspiring. In the capital city of Dublin, it is the iconic buildings such as the Trinity College with ninth-century Book of Kells, an illuminated manuscript that is a masterwork of Western calligraphy and is widely regarded as Ireland's finest national treasure, that capture the imagination of most travellers. The college was founded by Queen Elizabeth I in an effort to civilize the country, and since its doors were opened the likes Jonathan Swift, Oscar Wilde, Bram Stoker, and Samuel Beckett have become noted alumni. Around the city it is easy to feel as though you have stepped back in time with Georgian style buildings and 18th century squares around many corners. One stop for a Guinness along the Temple Bar district, and you will understand the importance of pub culture on the collective mindset of the people. Bursting with song, friendly with all, the pub atmosphere is an intimate way to decipher what is important to the everyday Irish. Never far from pub nor a cathedral, the country's most magnificent church we will discover on our Ireland group tours is also found in the capital. St. Patrick's Cathedral, which is said to be the earliest Christian site in Ireland, is where St. Patrick baptized converts. The present building was built between 1191 and 1270 but recent connections with Jonathan Swift of "Gulliver" fame, has made this an important literary pilgrimage as well. Out of the city, one truly starts to understand why Ireland group tours remain so popular. In the southernmost point of Ireland, at Healy Pass, have your cameras at the ready for some breathtaking scenery across the Caha Mountains that divide counties Cork and Kerry. The gorgeous green scenery does not stop there, something you will notice driving around the Ring of Kerry where we are continuously presented with a succession of picturesque land and seascapes. It does not take long to discover why Ireland has been bestowed with the nickname of the Emerald Isle. For those with a love of ancient history, there is no other landscape in western Europe with the density and variety of archaeological monuments as that in the Dingle Peninsula. With the preservation of over 2,000 monuments, this mountainous finger of land jutting into the Atlantic Ocean has supported various tribes and populations for almost 6,000 years. Whether you arrived to be blown away by the beautiful of the Cliffs of Moher at Galway, or were intrigued to better understand the connections between Ireland and Northern Island, there are many sides to this legendary country to fall in love with. Stone walled farms protecting sheep pastures, islands of saints and scholars, and lively pubs are all just an added bonus in a land as culturally rich as Ireland. Ireland group tours by Adventures Abroad take you to a land of such exquisite beauty that it is easy to understand why it has been the birthplace to some of the world's most compelling literature and art. The inspiration of Thomas Moore's writings came from the northern valleys of this island and we will surely see the extent of the land as we travel to its most northerly tip. The Ring of Kerry is a perfect example of the medley of geographic majesty that is contained here. From the massive peak of Carrantuohill, to the amalgamation of the sheer cliffs and sandy beaches around the Dingle Peninsula, this trip won't fall short in mystifying us. The enchanting history of this country lives on through the 17th century walls of Derry that have withstood numerous sieges over the centuries or through the Edwardian and Victorian buildings in Belfast. Join our Ireland group tours to see the Emerald Isle like never before! I especially enjoyed the up close and personal stops that Ann, our tour leader, included from her local knowledge. She was very enthusiastic and sensitive to the needs of the participants. Ann was full of energy and enthusiasm. She was full of knowledge on Ireland, it's history and customs. She made the tours very personal and was supportive and understanding to the personal needs of the participants. She made an effort to get to know each person individually. Awesome trip! It was a delightful group of people and a fabulous tour guide paired with an excellent driver. We enjoyed the scenic west coast of Ireland the most. In particular, Killarney, Dingle peninsula, Cliffs of Moher, Aran Islands. Also the Giant's Causeway. The local guides in Dublin, Londonderry and Belfast were very good. We had a small van for our small group and it worked out very well. The meals were tasty and substantial. There was generally a good variety of selections. A very good tour. I loved the Ring of Kerry, Dingle Peninsula and Aran Islands. Belfast, Dublin and Killarney were the best cities. The hotels were good and well located. Hotel staff were excellent and rooms were clean and comfortable. Another great Adventures Abroad trip! You never disappoint! Today we arrive in Dublin, Ireland's capital city. Since its beginning around AD 988, Dublin has accommodated many diverse nationalities from the Vikings and English invaders, to sailors, traders and writers who settled and lived here over the centuries. Modern Dublin is being transformed by enormous changes brought about by the recent economic boom, though the city will always have a reputation as a great historical city, and its strong links with world literature and the arts are readily apparent. Today we have a guided WALKING tour of Dublin. Our tour will likely begin with a visit to Trinity College and the Book of Kells. Founded by Queen Elizabeth I to "civilize" Dublin, Trinity College is Ireland's oldest and most famous college. You can walk in the footsteps of some of the college's noted alumni -- among them Jonathan Swift, Oscar Wilde, Bram Stoker, and Samuel Beckett. The Book of Kells is an illuminated manuscript that is a masterwork of Western calligraphy and is widely regarded as Ireland's finest national treasure. Transcribed by Celtic monks ca. 800, it contains the four Gospels of the New Testament in Latin. The decorations are all high quality and often highly complex. Some decorations can only be fully seen with magnifying glasses, although lenses of the required power are not known to have been available until hundreds of years after the book's completion! Merrion Square warrants a stop in order to learn about Dublin's Georgian past. The square was laid out after 1762 and was largely complete by the beginning of the 19th century. It is considered one of the city's finest surviving squares and the best-preserved Georgian era residential architecture. It also contains a statue of Oscar Wilde, who resided in No. 1, Merrion Square from 1855 to 1876. Also nearby are several government buildings and cultural institutions. Our tour continues to St Stephens Green, a leafy and peaceful oasis located at the top of Grafton St, the main street and commercial heart of Dublin, popular for shopping and people watching. We will stroll down Grafton and enter the area of Temple Bar, located on the south bank of the River Liffey, with it well-preserved medieval street pattern and narrow cobbled streets. 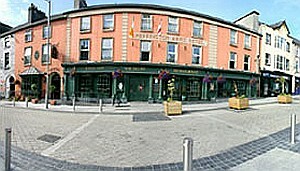 It is promoted as "Dublin's cultural quarter" with many pubs and a lively nightlife. Onto St. Patrick's Cathedral, the largest church in Ireland. Unusually, Dublin has two cathedrals belonging to the Church of Ireland, which act effectively as co-cathedrals. The site of St. Patrick's Cathedral is said to be the earliest Christian site in Ireland, where St. Patrick baptized converts. The present building was built between 1191 and 1270. For friends of world literature this is a pilgrimage and a must -- Jonathan Swift of "Gulliver" fame was Dean and is buried in the cathedral. Today we depart Dublin by road and travel south to Kinsale via a stop at the Rock of Cashel, in County Tipperary. Cashel was once the seat of the Kings of Munster and capital of this southern province. The Rock, which rears above the plain, dominated the land routes southwards. Kings of Ireland as well as Munster came to this spot and St. Patrick is known to have preached on the rock and converted the local King, Aenghus, here in the 5th Century. We continue to Kinsale via the Old Head of Kinsale, famous for its dramatically-located golf course, but also maybe moreso as the scene of a unique moment in maritime history. This is the closest piece of land to the wreck of the Lusitania, the ocean liner that was torpedoed by a German U-Boat in 1915. Kinsale is a delightful harbour town that has retained its old world charm and character despite being well developed from a tourism point of view. Kinsale styles itself as the gourmet capital of Ireland, boasting numerous excellent restaurants and atmospheric traditional pubs. While in Kinsale we will visit the 17th-century star-shaped Charles Fort, notably used during the Williamite War. Today we take the scenic coastal route to Killarney via Mizen Head, the southernmost point in Ireland, as well as Bantry House and Gardens and the French Armada Centre. From Bantry, we head north to Killarney via the Healy Pass. Have your cameras at the ready for some breathtaking scenery across the Caha Mountains that divide counties Cork and Kerry. After the mountain pass, we come to the town of Kenmare. The town was founded in 1670 by Sir William Petty and has a history of lace making. Our drive continues to Killarney, nestled just off the northern tip of Killarney National Park. Sites of interest in the town reflect it's strong religious and educational history. Killarney was a Church foundation from the 5th or 6th century, and settlement began here from around 1500. Today it's a lively, colourful place with lots of pleasant strolling, shopping and music. While in Killarney we will include an evening of traditional Irish music and dancing. As we circle around the Ring of Kerry today we are continuously presented with a succession of picturesque land and seascapes. This is some of Ireland's most spectacular scenery, including Dingle Bay, Ireland's highest mountain, Carrantuohill; Moll's Gap, Ladies' View and the world-famous Lakes of Killarney. We return to Killarney. Before and / or after dinner you can explore colourful laneways, historic buildings dating back to the days of the landlord, and experience the ambience of busy streets in the town centre. Killarney is a lively hub of activity with many shops, restaurants, and pubs. TODAY we include a packed lunch for our excursion and set you free to enjoy dinner on your own this evening. Today we explore the Dingle Peninsula. The Dingle Peninsula offers us more superb coastal scenery with a variety of beaches, mountains, and countryside. There is no other landscape in western Europe with the density and variety of archaeological monuments as the Dingle Peninsula. This mountainous finger of land which juts into the Atlantic Ocean has supported various tribes and populations for almost 6,000 years. Because of the peninsula's remote location, and lack of specialised agriculture, there is a remarkable preservation of over 2,000 monuments. We visit the Blasket Centre in Dun Chaoin, at the western end of the Dingle Peninsula. The centre celebrates the Irish language and the distinctive character of the people who once lived on the Blasket Islands. A main focus of the centre is the unique literary achievements of this isolated community off the Kerry coast, which was evacuated in 1953. We will also stop at the Gallarus Oratory, one of the finest examples of an early Christian church to be found in Ireland, dating from 800 AD. As early as the 6th century monastic settlements were built in remote areas of Ireland. This small oratory, built without mortar, uses corbel vaulting a technique developed by Neolithic tomb-makers. We continue to Galway via Cliffs of Moher, no doubt the highlight of our day. These great dark cliffs rise from the Atlantic to heights over 200m (656 feet). The panorama of the Clare coast is breathtaking, and these remarkable cliffs are home to a great variety of seabirds, including a puffin colony. On a clear day you can see the Aran Islands off in the distance. We also pass through an area called the Burren, a karst limestone region of approximately 300 sq km. It is composed of limestone pavements, which are eroded in a distinctive pattern known as 'karren.' This pavement is crisscrossed by cracks known as grykes and underneath the pavement there are huge caves and rivers that suddenly flood when it rains. It contains dozens of megalithic tombs and celtic crosses and a ruined Cistercian Abbey from the 12th century. We continue to Galway, one of Europe's fastest-growing cities with a population of 61,000. Galway is a major city by Irish standards, yet it still manages to retain much of the accessibility and congeniality of a small town. Galway is perhaps the most prosperous city in Ireland and arguably one of the most appealing. In the center of town, on Shop Street, is Lynch's 'Castle', dating from 1490 and renovated in the 19th century. It's the oldest Irish medieval town house used daily for commercial purposes (it's now a branch of the Allied Irish Bank). The exterior is full of carved gargoyles, impressive coats of arms, and other decorative stonework. Walk northwest 1 block to Market Street, and you'll see the Lynch Memorial Window embedded in a wall above a built-up Gothic doorway. It commemorates the 16th-century Mayor James Lynch FitzStephen, who condemned his son to death for the murder of a Spanish merchant. During the 170-year heyday of the tribes, Galway grew wealthy and cosmopolitan, with particularly strong trade links to Spain. Close to the city docks, you can still see the area where Spanish merchants unloaded cargo from their galleons. The Spanish Arch was one of four arches built in 1594, and the Spanish Parade is a small open square where visitors strolled in the evening. Local legend has it that Christopher Columbus attended mass at Galway's St. Nicholas Collegiate Church before setting sail for the New World in 1477. Originally built in 1320, the church has been enlarged, rebuilt, and embellished over the years. It has also changed denominations at least four times. Today we have an excursion to the Aran Islands. * A short ferry ride takes us to the "Islands of Saints and Scholars," located just off Galway. This is a true Irish experience where the approximately 1,200 locals speak Irish as well as English. The landscape of the islands is harsh: steep, rugged cliffs and windswept, rocky fields divided by stone walls. But there's a stark beauty about these blustery islands and the simple lives its inhabitants eke out of a few inches of topsoil and a mean sea. We visit Inis Mor (Arainn), the largest of the three islands, with a wealth of pre-Christian and Christian historical sites, interesting wildlife, plenty of pretty coastal scenery and charm. Our tour includes Dun Aengus, a Bronze Age and Iron Age fort situated on the edge of a cliff at a height of 100 metres (330 ft) overlooking the Atlantic Ocean. It consists of a series of concentric circular walls, the innermost -- the citadel -- encloses an area approximately 50 meters in diameter with 4 m thick walls of stone. We also visit Na Seacht dTeampaill (the "Seven Churches"), a monastic site and burial grounds dating back to the 7/8th centuries. We will also be able to enjoy the farming hamlets and one main town where we can have lunch and maybe do some shopping. Of course the islands are the home of the Aran sweater, which gained worldwide appeal during the course of the 20th century. We return to Galway with some free time before dinner. * PLEASE NOTE: Our excursion to the Aran Islands is dependent on weather, which sometimes causes the cancellation of ferries to and fro (if even in fine weather the short journey can be 'bumpy'). If we are unable to visit, we will replace this excursion with a bus trip to the Connemara region. Our early morning departure enables us to make the most of our day. Northward from Galway, we find beauty in the landscape as we travel from the west coast to the northern tip of the island. We pass through the once quiet village of Knock, which has since been transformed into a place of pilgrimage. In 1879, two village women saw apparitions on the gable of the church, and today more than one million pilgrims travel to see the 'Apparition at Knock'. The beautiful and varied scenery continues as we proceed on to Sligo. Nearby we visit the grave of poet/playwrite, William Butler Yeats (1865-1939), one of Ireland's most accomplished and renown literary figures. We will also pass through Donegal, once a Viking stronghold at the mouth of the River Eske. We spend about an hour in Donegal town to visit Donegal Castle and Magee's, the home of Irish Tweed, arriving in Londonderry / Derry*, Northern Ireland in the late afternoon. * The true name of the city of Derry or Londonderry is a subject of dispute between Nationalists (mostly Catholic) and Unionists (most of whom are Protestant), with nationalists calling it Derry, and Unionists, Londonderry. Although many Unionists will call it Derry in casual conversation, they generally insist on calling it Londonderry during political discourse; the reverse is not true of Nationalists. The most visible sign of this dispute to the visitor is in the road signage; those pointing to the town from within the Republic refer to it as "Derry", while across the border it is written as "Londonderry". We will start our walking tour at the city's original 17th Century walls which have withstood several sieges over the ages. Four main streets radiate out from the Diamond in the town centre where the town hall used to stand. We will be able to visit St Columb's Cathedral, one of the most important historic buildings within the walls. The history of the city from prehistoric times to the present can be seen in the Tower Museum, located in the O'Doherty Tower. The Guildhall, erected in 1890, is remarkably well preserved despite having been severely damaged twice during Northern Ireland's more recent tumultuous past. Its stained glass windows illustrate almost every episode of note in the city's history. Also outside of the city walls we will see the Long Tower Church, the oldest Roman Catholic church in town. Leaving 'Derry we head northeast along the coast road. 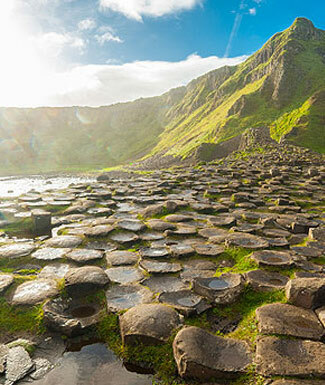 Our journey to Belfast not only takes us along one of the most scenic routes in all of Ireland, but it also passes Northern Ireland's most famous landmark, the Giant's Causeway, once believed to be the work of giants. Today we will visit these masses of basalt columns that form stepping stones climbing out from the sea up to the cliff. Some of the approximately 40,000 columns reach up to over 12 m (40 feet) in height. En route we visit spectacular Dunluce Castle where the limestone cliffs of the White Rocks end abruptly against a dark basalt outcrop crowned by the castle and joined to the mainland by an arched walkway. It is believed that the castle was built or (possibly) rebuilt by Richard de Burgh or one of his chief followers during the Anglo Norman period in Ireland. The site was certainly occupied as a fort prior to this time. The castle which has seen many additions to its original structure over the centuries gradually fell into disuse from the late 1600s. We travel further along the coastal route, eventually heading south with the North Channel to our left, arriving in Belfast in the late afternoon. Much of this city has been pleasantly pedestrianized, and in the early evening you may like to go for a stroll and explore this lively, cultural metropolis. Belfast is essentially a Victorian city, and no matter where you go you can see Edwardian and Victorian buildings with elaborate sculptures over the windows and doors. The City Hall (possibly closed for reburbishment), which dominates the main shopping area, was built in the grand Classical Renaissance style. We will visit St Anne's Cathedral, enlivened inside by mosaics and a floor made of stone from all parts of Ireland. Although the Cathedral was begun in 1899, it was not completed until 1981. During part of our day we will drive by the historic Belfast Port and Harbour, once the UK's largest shipyard and the building site of such famous liners as the Titanic. You will also learn much about the city's more recent history and the challenges it has faced during the times of 'The Troubles'. After our morning tour we return to our hotel for an afternoon at leisure. Today we depart Belfast and head south, stopping at Lisburn Linen to see the development of the linen industry of Northern Ireland. We also make a stop in Hillsborough, an exceptionally historic and picturesque village just outside of Lisburn. We arrive in Dublin in time to allow for some last minute museum browsing or shopping. 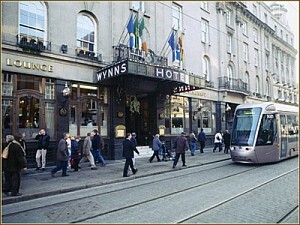 Situated in the heart of Dublin City Wynn's Hotel is only a few minutes walk to the Abbey Theatre, Trinity ...	Temple Bar and Dublin's two premier shopping streets. It has been a well known Dublin landmark for over 150 years providing luxury accommodation to many famous personalities and dignitaries. TV, phone, hair dryer, iron, tea / coffee facilities. A hotel has overlooked the Fairfield for over 200 years. 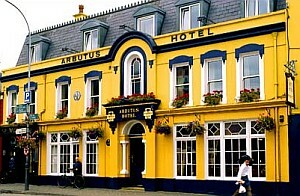 It became the Arbutus in 1926, when it was renovated. ...	room has its own distinctive décor. Rooms are designed as a haven as well as a place to sleep, some where to read, think or chat. The Skeffington Arms Hotel is ideally located in an enviable position in the heart of Galway City, overlooking the newly ...	Eyre Square, within distance of rail & bus terminals & just a short stroll from an array of shops, restaurants, bars and theatres. The Skeffington Arms Hotel Galway offers 24 modern, spacious & comfortable newly refurbished bedrooms. Breakfast and dinner (hotels & local restaurants) daily. All transport, accommodation, sightseeing and entrance fees for sites noted as 'visited' in the detailed itinerary. Gratuities for local guides, drivers, restaurant staff, porters (if available) Airport transfers for land & air customers and for early arriving / late departing land & air customers who book their extra hotel nights through us. International airfare to/from the tour. Tour Leader gratuities, lunches, drinks, personal items (phone, laundry, etc), international air taxes (if applicable), excursions referenced as 'optional'. Airport transfers for Land Only customers. Optional trip cancellation insurance. Our post-reservation trip notes offer further guidance on optional meal costs and shopping. This tour is offered in spring and late summer/early fall when crowds are thinner. Showers, rain, mist are possible any time of year. Land transport throughout by private air-conditioned motor coach, 24-36 seats depending on ultimate group size (see 'group size'). Distances are not that great in Ireland though we will have a couple of full bus days with plenty of scenery and stops of interest. We will have some walking tours on uneven surfaces though this tour overall is not terribly strenuous. Well-located, mid-range hotels (3-star) throughout. Many are smaller properties (3-4 story) that may not have elevators. All hotels have en suite toilet and bath, though some will have shower only (no tub). Porters are sometimes available but you must be prepared to manage your own luggage.